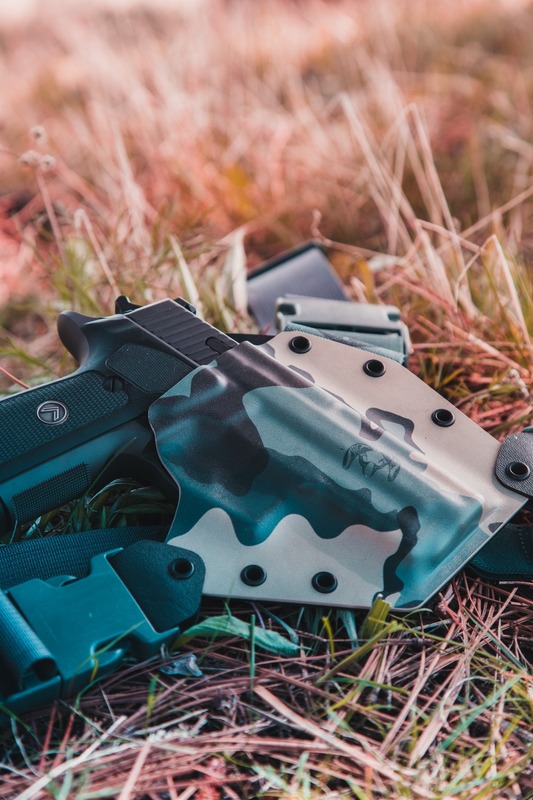 Tell us what firearm you would like a holster for. We have over 200 firearm molds available for the Kenai - if you don't see your gun here please contact us! 911 .380EMP 3" 9mmXD 3" SubcompactXD 4" ServiceXD 5" TacticalXD Mod 2 4" ServiceXD Mod 2 5" TacticalXD Mod 2 SubcompactXD Mod 2 Subcompact .45XDE 3.3"XDM 9/40/45 3.8"XDM 9/10/40/45 4.5"XDM 9/10/40/45 5.25"XDS 3.3"XDS 3.3" w/Crimson Trace LG-469 redXDS 3.3" Mod 2XDS 4"
The Texture and Color of the front piece of Kydex. All camo and patriotic prints are a high quality die sublimation process print. This process is highly durable and resistant to scratching, chipping or flaking. Fabric Wrap is 1000d Cordura applied with an industrial adhesive. This process is time consuming but results in a quieter than traditional Kydex holster. 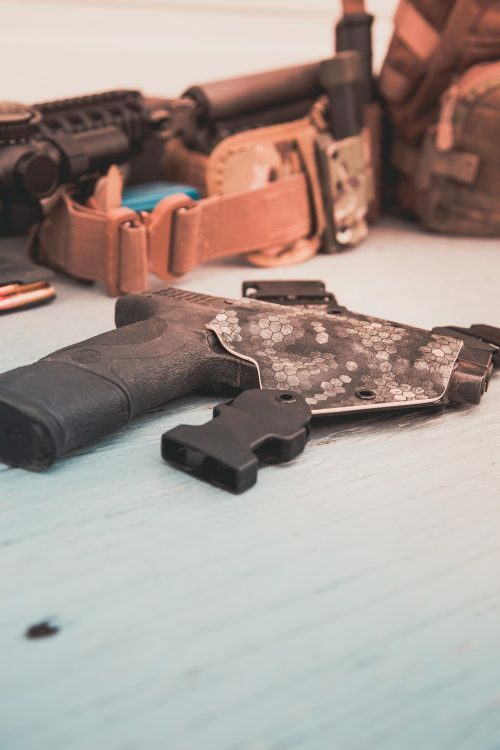 Lightly Textured Premium .08 Thickness Kydex. 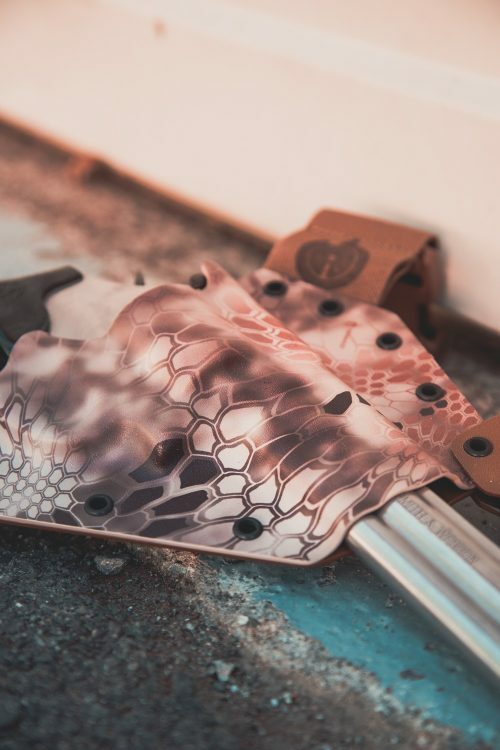 The color of the Back piece of Kydex. There are many brands and models of 1911s. Please let us know what yours is so we can have the best fit possible! The more details the better. Let us know if you have a taller than stock slide stop/release. Our molds accommodate slightly taller than usual sights by default - but if you have abnormally tall sights, please let us know. Let us know if you have a taller than stock magazine release. Red Dot Sights are increasingly popular on Pistols. Please let us know if you are running a Red Dot on your gun - we have to cut the shell differently. Open ended holsters make for a smaller form factor on the chest. Closed end offer better protection of the firearm. We recommended open end holsters for guns Glock 19 sized and larger. 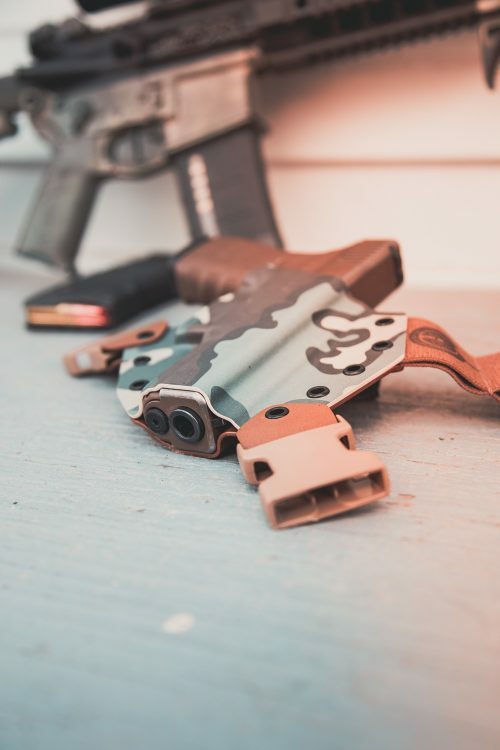 We recommend closed end holsters for guns Glock 26 sized and smaller. Let us know your revolver model and barrel length for the best possible fit! Target barrels, bull barrels, etc change the dimensions of the gun from a standard mold. 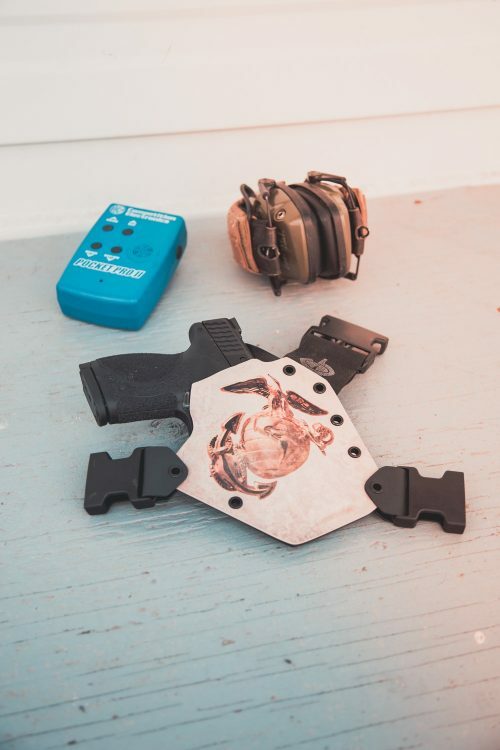 Let us know if you are running a tactical light. * Light bearing holsters will be made closed end unless specified in the holster notes. Want a way to carry spare magazines or rounds? This is a superb holster. Very comfortable to wear and is very adjustable too. Custom fit to my Glock and even custom fit to my added laser/light on the rail. I can draw my weapon and use either the light or laser at night. LOVE IT. Flawless. Highly recommended !!!! Although being a bit pricey and snug for my firearm, I’m very pleased with the holster. I was able to climb, move through brush, and use my rifle with no problems and in comfort. 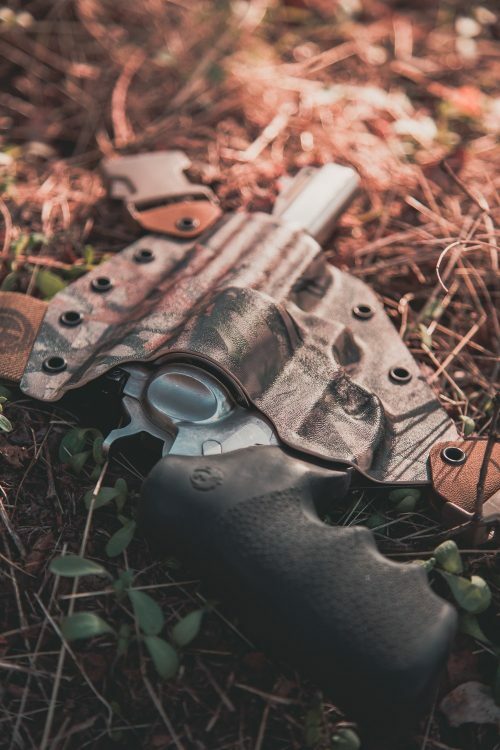 Great holster! Perfect fit for my Glock G40. I hunt whitetails in some very thick areas and need to be mobile. This holster is very comfortable to wear all day. I do NOT recommend the spare mag carrier. I lost a full G40 mag on a hunt due to the loose fitting elastic retaining strap. This is why only 4 stars. I needed something that I could wear while working on the ranch …. remember if you have your weapon on a belt It usually goes out of reach if you have to takeoff your pants! This chest rig make it to easy to get in and out of the truck… Without your side arm and getting caught up in the safety belt . 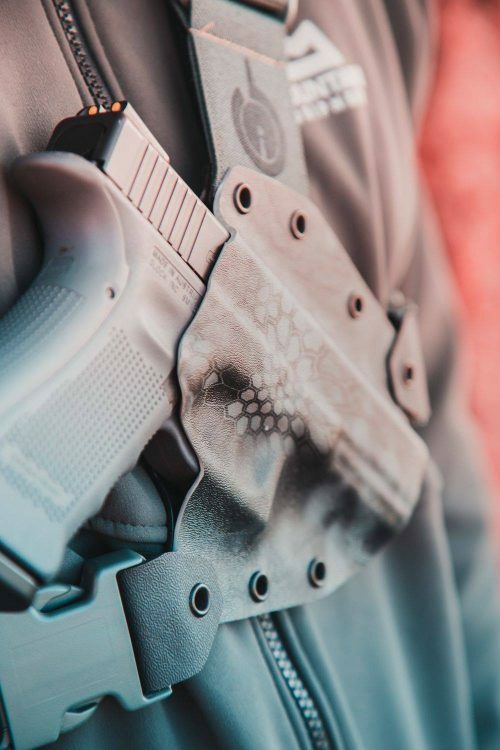 This rig is so comfortable that you don’t even know you have it on and that is the biggest compliment anyone could ever give to a weapon retention system! 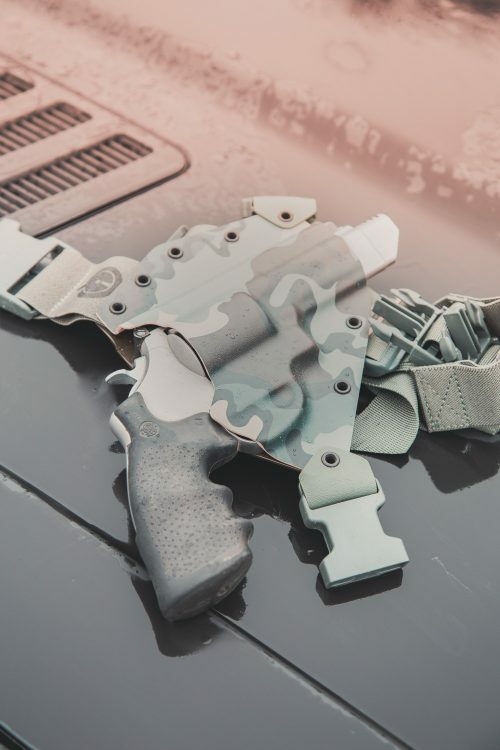 I thought it was brilliant the way they have the mag released half exposed so you can’t remove your mag without removing your weapon from the holster . The mag release is totally protected in will not release prematurely it seems they have fixed that problem from that other review if was actually a problem?? This is a extreme game changer specially if you’re trying to do work but maintain your safety! I have a Glock 40 MOS. 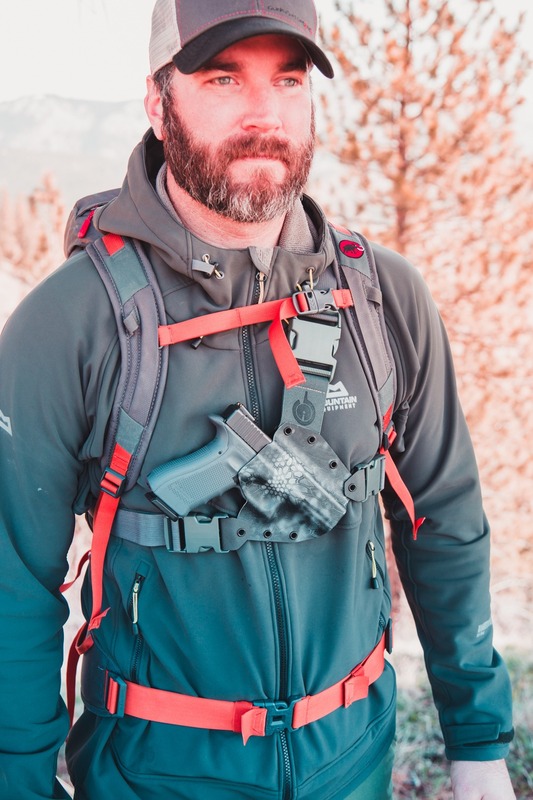 I purchased one of these Kenai chest rigs a few months ago for my 1911 colt commander . ive finally got it fitting the way it feels the most comfortable, but ill prolly change it again. I trimed a bit of excess strap off and still have plenty. i took the rest and looped it back in and around the buckles so i can still readjust it if i wish. depending on which coat or T shirt im wearing at the time. I ordered a custom version with the cloth covered front for quietness as ill have a Badlands bino harness on over it. I decided on getting one of these because with a backpack on you cant have your pistol on your belt, the waist belt of the pack is in the way. under your arm , the shoulder strap from the back pack is in the way. it took “about” a month to get it, hey – it takes a bit for them to make it,, so , no worries from me. I did need to use a hair dryer on it to Relax the retention on the trigger guard as it took both hands and alotta effort to pull my pistol out, if you do that, dont over do it. mine now pulls out nicely but still requires some elbow grease to pull out. I dont want it falling out by itself, so i left it a hair tight. all in all – this is a sweet set up, im getting a 629 fairly soon. so, ill be ordering yet another one of these Kenai chest holsters. All i can say is .. get one, youll be glad you did. 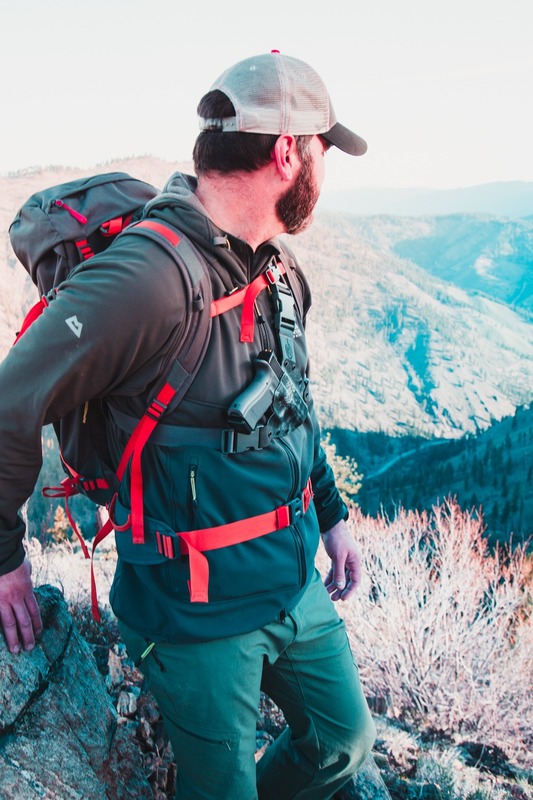 The Kenai Chest Holster was designed as the ultimate way to carry a firearm when hiking, hunting, fishing or any other outdoor activity. We settled on a blend of Kydex and Nylon for excellent retention characteristics, weatherproofness and light weight. 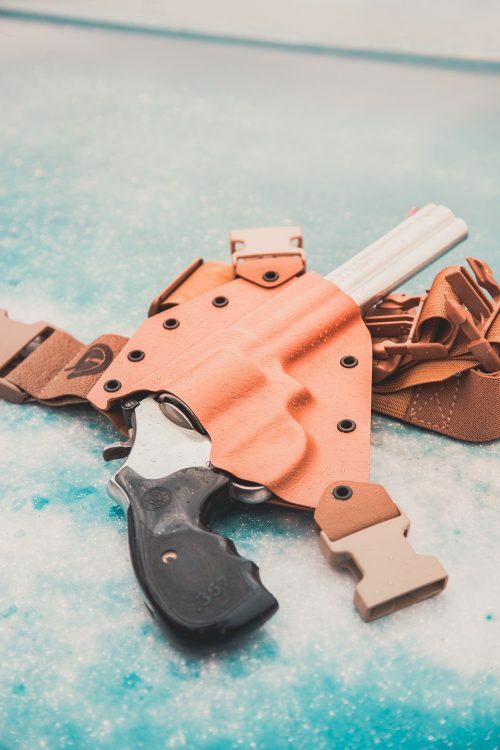 The Kenai Chest Holster is a perfect pairing with a modern firearm such as the Glock 40MOS or a classic big bore revolver such as the Ruger Super Redhawk. 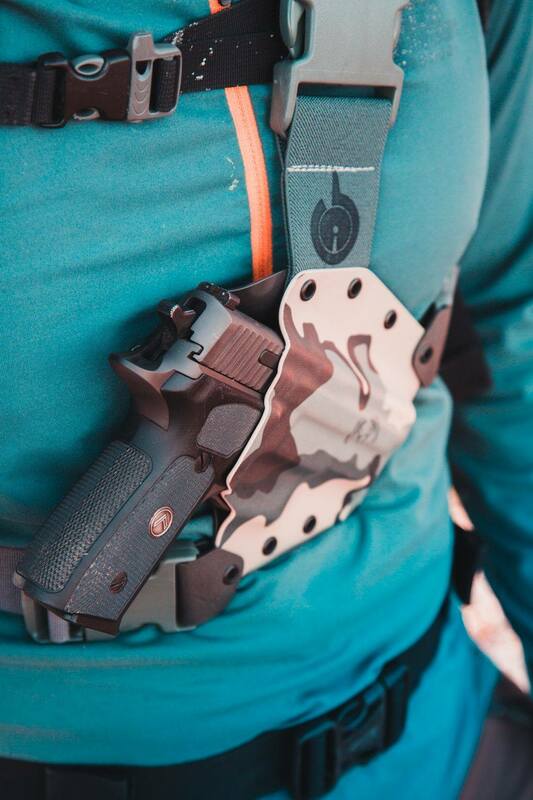 No mater what you’re doing in the backcountry, the placement of the firearm on your chest helps you to be a hard target anywhere, without compromising on choice of firearm. You can carry as big of a firearm as you’d like with maximum comfort. The centered position on the chest allows for a quick draw from any position, even when wearing bulky winter clothing or seated in a vehicle. 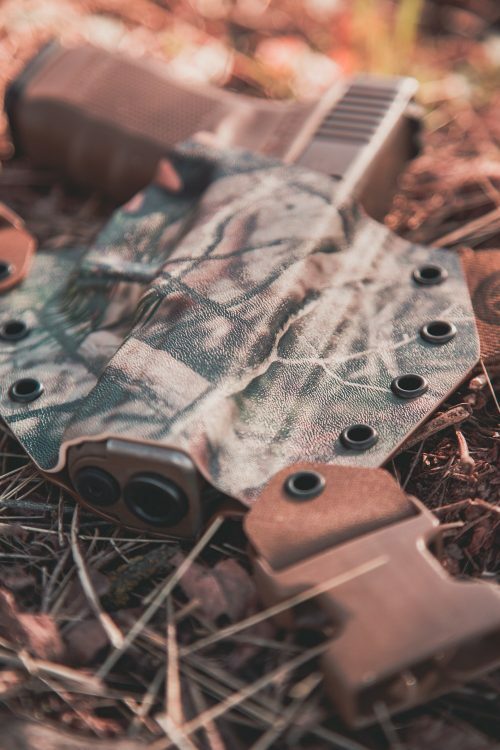 Learn more about the Kenai Chest Holster here.